More than 50,000 are dead, and about 3 million homeless, after a large earthquake shook Pakistan's Northwest Frontier Province on Oct. 8. With mountain villages and roads destroyed, hundreds of thousands are still waiting for relief as winter approaches. Fortunately, the death toll will never approach that of the disastrous Dec. 26, 2004 earthquake, which started a tsunami that devastated coastlines from Sumatra to India and killed an estimated 285,000. The Indian Ocean quake was the strongest in 40 years, and it struck a region where a cataclysmic earthquake was not expected. Those death tolls make us think it's time to get a better grip on earthquake science. How does the Earth shake? Can we expect any improvements in earthquake prediction? Are we getting better at pinpointing their hazards? Earthquakes are ground motion that occurs when adjacent parts of the Earth suddenly slide past each other. Most earthquakes occur at boundaries between the giant plates that make up Earth's crust. These plates "float" on deep, hot, gooey rock called the mantle, slowly moving in relation to each other, at speeds of up to a few centimeters a year. Tectonic plates are usually jammed together by friction. But when the stress is great enough, the plates finally start sliding. 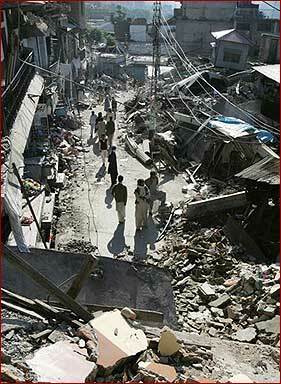 A large quake, like the one in Pakistan, can cause shaking for hundred of kilometers. How are these four quakes along the Sunda Fault related? Progressive earthquakes can give insights into the difficult problem of earthquake prediction. A huge earthquake, like the one that caused the Indian-Ocean tsunamis, can shake the entire Earth. According to estimates, that quake had the power of 475 million tons of TNT. The amount of energy released depends on how long the strain has been building up, on the geometry and composition of the plates involved. Depending on conditions, the speed, geographic reach, and intensity of an earthquake can vary from nearly undetectable at a short distance, to catastrophic for hundreds of kilometers. What do earthquakes tell us about the structure of the Earth? There are pages in this feature plus a bibliography and a credits page.